Kanayathu Koshy describes the agenda for the newly-established Pacific Centre for Environment and Sustainable Development. The author is Director of the Pacific Centre for Environment and Sustainable Development based at the University of the South Pacific in Suva, Fiji. The need for the University of the South Pacific to develop a more focused and collaborative approach to environmental education, research, consultancy and capacity building became very obvious during an extensive consultative process conducted recently. This consultative process was undertaken by the University, both internally and within its twelve member countries, as part of the preparation of a strategic plan. This observed need had a lot to do with the realization that the economic development models that have been adhered to over the past fifty years or so have so stretched the tolerance margins of nature. These models are seen to be depleting scarce resources, especially in ecologically-fragile and relatively resource-poor island environments, and undermine the very development that they have been designed to promote. There is, thus, a need for a new paradigm of development that is protective of the environment, that is, both the natural and human environment. To address such a situation, the United Nations Global Conference on Environment and Development, the Earth Summit held in Rio de Janeiro in 1992, highlighted the need to address trends of irreversible environmental degradation. These trends were seen to include global climate change, the loss of biodiversity and the linkages of such environmental change with the problems of increasing population, increasing poverty, over-consumption and pollution. Agenda 21, the action plan for addressing these issues and promoting environmentally sustainable development in the 21st century, arose out of the deliberations of the Earth Summit, as did the UN Framework Convention on Climate Change and the Convention on Biological Diversity, to which most of the University of the South Pacifics member countries are signatories. The serious implications of global environmental change for small island states were clearly recognized and stressed at the United Nations Conference on Sustainable Development in Small Island Developing States held in Barbados in 1994 at which the Barbados Program of Action was adopted. Of particular concern were global climate change scenarios and associated increases in sea level that threaten to submerge low-lying islands and atolls, inundate the coastal zones in other islands and usher in extreme events, such as cyclones, tidal waves, tsunamis, flood, droughts and disease infestations, of unprecedented severity and frequency in the tropical belt. The resulting ecological and economic vulnerability is recognized to be one of the major development challenges for the small island nations of the Pacific as we start the new millennium. Realizing this development dilemma, Pacific Island states, with the assistance of the South Pacific Regional Environment Programme, have taken a leading role in discussions relating to global environmental change and sustainable development. Such discussions began with the signing of the South Pacific Declaration on Natural Resources and the Environment at the Rarotonga Conference on Human Environment in the Pacific Islands in 1983. The South Pacific Regional Environment Programme, and high-level representations from the Pacific Islands, together with other non-Pacific Island nations, under the umbrella of the Alliance of Small Island States (AOSIS), have strongly represented the region in international lobbying at fora such as the Earth Summit and the Barbados Conference where important environmental policies have being negotiated and ratified. The region and the individual Pacific Island nations have made a strong commitment to international efforts to prevent further irreversible environmental change and to promote sustainable development by becoming party to other important environmental conventions and treaties. These commitments, both at the national and regional levels, mean that the Pacific Island countries must consider seriously what actions need to be taken, and what capacity building will be necessary, to address the major environmental and social constraints to sustainable development. increased awareness among both policy makers and the general public of the nature of the environmental issues and current development activities that serve as threats to environmentally- and culturally-sustainable development in the Pacific Islands. 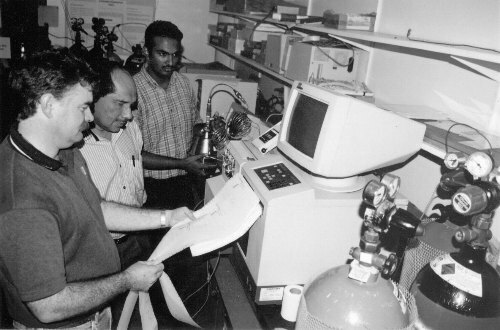 Although a number of University of the South Pacific sections, staff and senior students, and the increasing pool of its graduates, have been active in many critical areas related to environmental science and in the practical application of environmental science to the promotion of sustainable development in the Pacific Islands, the University has not had the required organizational structure to coordinate such activities. As a result, the internal coordination and optimalization of environmental activities have often been difficult. It has been not been easy, for example, to achieve economies of scale and to optimalize cooperation with other national, regional, international organizations and agencies involved in environment and sustainable development-related activities. Accordingly, and given the urgency with which Pacific Island states need to address the issues of global and local environmental degradation and to promote more environmentally sustainable development, the Strategic Plan of the University of the South Pacific recognized the need for the strengthening and better coordination of activities in the area of environmental management and sustainable development. It was agreed that this would be one of the five key academic areas for focused development during the next decade. Within its mandate, University of the South Pacific will develop a coordinated response to the needs of the region in the areas of sustainable development and environmental management. Priorities will be developing appropriate programs and courses to meet needs in the areas, and establishing an appropriate organizational structure. Further, given that these declarations reflect a fundamental shift in development thinking, the University will ensure that its teaching, research and consultancies take full account of this significant change. The Pacific Centre for Environment and Sustainable Development (PACE-SD) was subsequently established with a Director having assumed duties as of August 2001. Rather than creating a department dedicated solely for the environment, the strategy here is to integrate an environmental perspective into the teaching and research expertise of each and every faculty, department and section at the University of the South Pacific. It is widely accepted that a highly centralized and strongly departmentalized approach to programme development, as usually followed in many universities, may inhibit innovation and multidisciplinary collaboration in environmental education, research and consultancy. The whole idea of the Centre has been conceived recognizing the need to achieve a greater level of integration among disciplines, but at the same time to preserve the strength that comes with the individuality of the single discipline and, indeed, the creativity of the individual investigator. 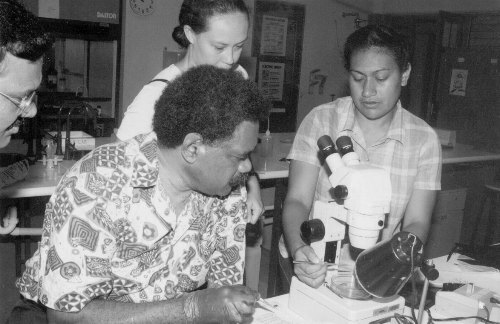 Most research at the University of the South Pacific is currently being carried out by individuals or small groups working on well-identified short-term projects. Although fundamental discoveries are often made at this level, with the rapid advances in information technology and improved capability for networking and sharing of information and data, it is through a more open forum, of the kind that will hopefully be provided by the Centre, that such individual findings and interdisciplinary conclusions can receive wider consideration. There should follow, therefore, the means for more universal applications to solving the unique environmental and development problems of the Pacific Islands. To serve as a focal point for the integrated study of environmental and development issues at the University of the South Pacific by addressing key global and local environmental issues as they affect the people and environment of Pacific Island countries, and in particular to determine how they can best be addressed in an effort to promote environmentally and culturally sustainable development in small island states. To coordinate, stimulate and catalyze undergraduate and postgraduate teaching and research in the field of environment and sustainable development. To help improve synergism inside and outside the University of the South Pacific in dealing with environmental issues and promoting sustainable development. To serve as a platform or channel for international-regional interaction on environmental and sustainable development issues of global and local concern, and to facilitate access to global environment research funds. Such activities will focus particularly on those areas where the University has proven expertise, for example, in scientific research, in the application of research to development planning, and in the development of data bases, information exchange systems and in geographic information systems. To serve as a focal point for the promotion of ethical and culturally sensitive environmental and development research, and to develop models and appropriate protocols to protect the intellectual property rights of Pacific Island nations and communities. This would act to insure that appropriate recognition and/or compensation is given in relation to research, publications, bioprospecting activities, biodiversity collections and resultant outputs, discoveries or financial gains. Endorsing the view that through education should come the planning, decision making, action and the code of behaviour necessary for the conservation and sustainable use of natural resources and the protection of intellectual property rights, the University has been actively pursuing an education policy which incorporates both formal and non-formal programmes in its environmental education and awareness building. the Postgraduate Certificate in Climate Change Vulnerability and Adaptation Assessment. There are also other courses with environmental content in disciplines such as chemistry, physics, economics, sociology and education. However, the University is aware that much more needs to be done. More certificate and diploma programmes, conjoint degrees, modularized teaching methods and credit-based completion of programmes are some of the ways in which the differing demands of the student community, especially part-time and extension students, can be met. There is also a need for more applied and in-service courses in selected aspects of environmental management and sustainable development that can be perhaps best coordinated by the Centre. One of the major challenges facing the Centre is to substantially expand the research and consultancy base, particularly applied research, of the University in the relevant environmental and development areas. There are excellent examples of individual and small-team efforts to address specific environmental and sustainable development problems. These have great scope for taking on wider national, regional and international dimensions and to be more applied in nature. This would include the promotion of greater collaboration and networking with national, regional and international agencies involved in global change, environmental management and sustainable development-related activities. An integrated approach involving the natural and social sciences and humanities in order to better understand the causes and consequences of global environmental change and its human dimensions will have more regional relevance and international significance. Such an approach will strengthen the Universitys and the regions ability to improve environmental education and to promote environmentally sustainable development at the regional, national and local or community levels. Climate change: includes sea level rise, changes in atmospheric composition, the Earths changing ozone levels, palaeoclimatology, energy studies, and vulnerability and assessment. Climate variability: includes seasonal and interannual variability resulting from ENSO and other extreme events. Biodiversity: includes scientific studies and analyses of terrestrial, marine and freshwater biodiversity, with special emphasis on the unique and fragile biodiversity of oceanic islands and the identification of major threats to island biodiversity. The promotion of community-based conservation and sustainable use of island biodiversity, the study of the impact and control of invasive organisms, and bioprospecting to identify organisms of potential economic and scientific value. Integrated coastal zone management: includes management of coastal areas of large islands, the intertidal zone and near-shore fisheries management, and management of atoll and small-island ecosystems which, in their entirety, constitute coastal zones. Land use and ecosystem change: includes geographic information system applications, remote sensing and planning applications to monitor changes in land use and resource utilization that can be used as a basis for improved planning. Cultural ecology and ethnobiology (the human dimension): includes the study of the traditional knowledge, uses, beliefs, management systems and language that Pacific societies have for their environment and biodiversity. This includes the study of how this can be adapted to the promotion of environmentally sustainable development in the Pacific Islands, where most of the land and resources are still owned, used and controlled by indigenous peoples or traditional users who often view the land and waters and the associated living and non-living resources as having far greater value than economic utilitarian value alone. Sustainable development options: includes studies of current and potential development models, projects and initiatives to improve our knowledge of the key environmental, social and economic factors that contribute to sustainability or unsustainability as a basis for the development of more environmentally-sustainable development options for the Pacific Islands. Intellectual property rights and environmental research ethics issues: includes the integration of such considerations in all teaching, research and consultancy activities and to actively collaborate with all local, national and international agencies to develop relevant protocols for the Pacific Islands. For all the Centre activities, all relevant sections of the University are making substantial contributions in a mutually supportive manner. Teaching departments, relevant university institutes, special programmes, and other support services will be key to the success of the Centre. The vision here is one of mutual support and healthy collaboration avoiding unnecessary duplication of programmes and activities, current or planned, within the University. Recognizing the facilitating and coordinating role the Centre assumes in much of its operations, it is clear that it has to liaise effectively and work closely with all the major environmental agencies operating within and outside the region. The Centre also serves to facilitate work with major environmental funding agencies, such as the Packard Foundation, the MacArthur Foundation, the Maruia Society and development assistance agencies, such as New Zealand Aid, Australian Aid, the Global Environmental Facility and other agencies that actively fund environment and sustainable development projects in the region. The Pacific Centre for Environment and Sustainable Development is governed by a committee and managed by the Director, assisted by a secretary and other part-time staff as well as the programme assistant of the START-Oceania secretariat based at the University of the South Pacific. All appropriate University part- and full-time staff members are associates of the Centre and thereby provide the core of the teaching, research and consultancy staff. In many parts of the world, environmental degradation, poverty and societal breakdown have reached an almost irreversible state because the developmental elite, including major education and research organizations, have failed to recognize the signs of environmental unsustainability until too late. The Pacific Island nations, however, have a chance to break with this trend but it is clearly at the threshold. Most of our environments are still intact, and our island communities still have relatively sustainable resource-use traditions and traditional environmental knowledge. It is clear that if something is not done now to address the major environmental issues facing island states such as global warming, loss of biodiversity, increasing pollution and waste disposal problems together with the loss of traditional environmental knowledge, many of our islands will soon experience irreversible environmental and cultural breakdown and developmental unsustainability. If we agree that it is the unsustainable development paradigm that has been followed in many parts of the world since the industrial revolution that brought us to the current state of the environment, we must opt for a shift and that must be to a sustainable development strategy which avoids waste, increases efficiency, provides for today and keeps some for tomorrow. Pacific Island countries have, therefore, the opportunity to promote a more environmentally- and culturally-sustainable process of development. The University of the South Pacific and the new Pacific Centre for Environment and Sustainable Development, as the major educational, scientific and research agency in the region, will be able to play an even greater role in addressing the increasingly daunting challenges as the small island states of the Pacific Ocean engage the new millennium. 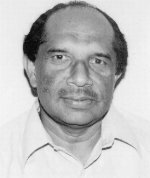 Kanayathu Koshy, Pacific Centre for Environment and Sustainable Development, PO Box 1168, University of the South Pacific, Suva, Fiji. Fax: +679-302548. Email: koshy_k@usp.ac.fj. Web: www.usp.ac.fj.